What are the Best Online Associate in Administrative Assistant Programs? What Else can I Expect from an Online Administrative Assistant Associate Degree? What Can I Do With an Administrative Assistant Associate Degree? The skills learned in administrative assistant associate programs are applicable to nearly any type of business. Regardless of industry, location, or size, every office requires workers who can produce business documents and maintain records. This degree prepares you to succeed in a variety of roles and provides a practical way to gain entry-level employment in many different fields. Future employment prospects vary by industry and specialization. For example, the Bureau of Labor Statistics (BLS) projects an 8% decrease in the number of bookkeeping, accounting, and auditing clerk jobs. In contrast, analysts predict strong growth in the medical field, with a projected increase of 15% in the number of medical records and health information technician positions. You should carefully consider what specializations and/or elective training options are available when selecting a program. Brigham Young University in Rexburg, Idaho, first opened its doors in 1888. Associated with the Church of Jesus Christ of Latter-Day Saints, this institution helps degree seekers across the country finish their associate degree in administrative assistant online without ever visiting campus. BYU-Idaho's two-year program requires distance students to complete 60 credits in the areas of interpersonal theory and practice, office procedures, introduction to Microsoft Excel, and word processing. Upon finishing the degree, alumni work in legal offices, schools, doctor's offices, small businesses, and corporations. BYU-Idaho also provides a bachelor's degree for those looking to continue their education after graduation, along with a certificate option. Regardless of residency, all virtual degree seekers pay the same tuition rate of $172 per credit. BYU-Idaho accepts applications four times per year and allows newly admitted students to begin programs during the fall, winter, spring, or summer semesters. Transfer students can appeal to the registrar to count prior credits toward their BYU-Idaho degree. In addition to several social media outlets, including Facebook, Twitter, and Instagram, the school also maintains five different YouTube channels for prospective learners looking to find out more about BYU-Idaho. The Northwest Association of Schools and Colleges (NASC) provides BYU-Idaho with regional accreditation. As the third largest college within the North Dakota University system, Bismarck State College enrolls nearly 4,000 campus-based and virtual learners each academic year. 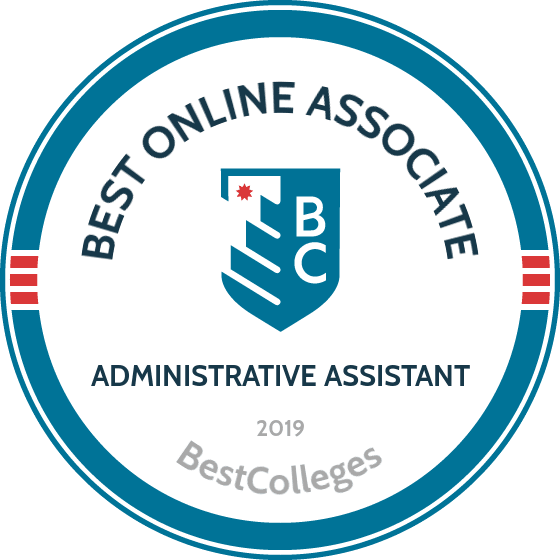 Alongside a string of other distance learning programs, BSC provides an associate degree in administrative assistant online program for those who want to use their skills in communication, organization, technology, and management to serve the needs of various offices. In addition to a general associate of applied science in administrative assistant program, BSC provides two concentrations in legal or medical administrative support for students. To excel in any of these programs, applicants should already possess professionalism, punctuation, spelling, grammar, and multi-tasking skills. To graduate from BSC, students must earn between 61 and 63 credits to receive a diploma. Some topics covered include introduction to professional writing, human resources management, fundamentals of public speaking, and computer software applications. In their final semester, online and campus-based students alike take part in a cooperative education/internship experience. Virtual learners work with the department to find a suitable and approved location in their area. Individuals with previous higher education experience can transfer up to 45 credits to BSC, provided they come from a regionally accredited institution, meet programmatic requirements, and earn a 2.0 GPA or higher in each course. BSC holds regional accreditation through the Higher Learning Commission (HLC). From its home base in Bemidji, Minnesota, Northwest Technical College provides many options for students near and far seeking a quality two-year education. Although the school maintains a small student population, it is a member of the Minnesota State Colleges and Universities System. The institution's associate degree in administrative assistant online program trains future receptionists, secretaries, office assistants, and office managers in the skills and competencies needed to support and manage large and small professional settings. Offered as an associate of applied science, this two-year degree covers topics like desktop publishing and presentation graphics, advanced administrative office applications, leading and facilitating teams, and principles of bookkeeping. NTC does not require learners to complete an internship, but they can add this to their program if they so choose. Enrollees must complete 60 credits prior to graduation. NTC maintains an overall placement rate of 100%, meaning every graduate finds work soon after receiving their degree. Associate degree graduates may also go on to pursue bachelor's level programs at Bemidji State University online. Although NTC does not require ACT or SAT scores as part of the admissions process, all prospective students must take the ACCUPLACER assessment to determine their college readiness. No matter where they live, all distance students pay the same tuition rate of $199 per credit. In addition to locations in Charleston, Mount Pleasant, Moncks Corner, Hollywood, and Summerville, Trident Technical College in South Carolina also maintains a thriving online campus. Among the options available, students can complete an associate degree in administrative assistant online without ever visiting any of TTC's physical locations. Provided as an associate in applied science in administrative office technology, this 66-credit option takes approximately two years of full-time study to complete. Along with general education requirements, learners study microcomputer multimedia concepts and applications, administrative systems and procedures, introduction to web page publishing, and introduction to international business. Students can also select from a wide variety of electives to further enhance their knowledge. For those interested in healthcare, TTC provides a medical office specialist certificate. To apply, prospective learners must submit high school transcripts with a GPA of 3.0 or higher, proof of English and math proficiency, and ACT or SAT scores. Once enrolled, distance students can take advantage of many of the same resources as their on-campus counterparts. These amenities include academic advising, a writing center, learning assistance, an e-library, testing services, and a bookstore. Although Minnesota West Community and Technical College only began in 1997, the institution now maintains five campuses throughout the North Star State and boasts a growing distance learning platform and three learning centers. The associate degree in administrative assistant online path allows learners to gain the competencies needed to serve in a variety of professional office settings. Graduates with this associate degree possess knowledge in data entry, business communications, accounting, records management, filing, word processing, machine operation, and office management. Some of the specific topics covered include customer service for office professionals, principles of management, database concepts and applications, and introduction to microcomputers. Distance learners generally spend two years of full-time study completing 60 credits. Although MWTC does not require applicants to sit for the SAT or ACT to receive admissions consideration, they must take the ACCUPLACER assessment to determine where they fall on the academic preparedness spectrum. Prospective students must also pay a $20 application fee and submit any previous transcripts. All online students pay the same rate of $202.23 per credit. Operating as part of the Alamo Colleges District, Palo Alto College in Texas maintains a dynamic degree roster for students near and far who want to further their education on campus and online. The associate degree in administrative assistant online ensures graduates possess the technical and practical skills needed to thrive in 21st century offices. Distance learners spend two years moving through coursework requirements that include a summer session during their first year. Virtual students must successfully pass 60 credits to graduate. Learners also study records and information management, business math using technology, integrated software applications, and business correspondence and communication. During their final semester, all students participate in a cooperative education capstone class that helps them build administrative and secretarial skills in a practical setting. Distance learners typically need to find these locations on their own and obtain departmental approval. Before receiving programmatic admittance, all prospective students must prove that they can type at least 20 WPM with five or fewer errors. They must also provide proof of a GED or high school diploma and participate in a placement examination. While Texas residents pay only $80 per credit, those living outside the Lone Star State must pay $368 per credit unless they secure scholarships and/or grants. While some classes exist in an asynchronous format, the school also utilizes interactive video conference courses. Individuals concerned about specific class times should speak to a programmatic administrator to learn more. Riverland Community College offers campuses in Albert Lea, Austin, and Owatonna for southeastern Minnesotans looking for quality two- and four-year educations. Riverland also maintains a distance learning program. The associate degree in administrative assistant online path introduces learners to the skills needed to take on support and managerial positions in all types of professional offices. Students spend four semesters completing the 60 required credits in this associate of applied science. Some standout courses include productivity and project management, database concepts and applications, applied principles of bookkeeping, and office supervision and management. As part of the training, Riverland's program incorporates what it calls the "laptop advantage," an innovative model that ensures students gain hands-on experience using business machines, software, and computers commonly used in professional settings. Applicants can begin their studies during the fall or spring semesters if they meet all admission requirements. These include submitting a high school diploma or GED; providing ACT, SAT, MCA, or ACCUPLACER scores; and participating in an online orientation. Riverland's associate degree in administrative assistant online program maintains accreditation through the Accreditation Council for Business Schools and Programs (ACBSP). The school also holds regional accreditation from the HLC. All students pay the same tuition rate for virtual classes. They must also pay a required $300 laptop lease fee each semester. Federally designated as both a Hispanic-serving institution and a historically black college, Saint Philip's College in San Antonio, Texas, serves a diverse student body of nearly 12,000 learners. Like Palo Alto College, SPC serves as a member of the Alamo Colleges District. The associate of applied science in administrative office technology takes place fully online and allows virtual degree seekers to finish requirements in two years from start to finish. While completing coursework, all SPC students may sit for the Certified Microsoft Office Specialists (MOS) exam. In terms of coursework, students must pass 60-61 credits to receive their degree. Covered topics include records and information management, business correspondence and communication, and introduction to presentation graphics software. During their sixth semester, all learners participate in an administrative assistant and secretarial science internship at an approved site near their place of residency. Students who want to focus their studies in healthcare or law can elect to pursue concentrations in legal administration, medical administration, application support analyst, or internet marketing strategist. SPC maintains accreditation through the Southern Association of Colleges and Schools Commission on Colleges (SACSCOC). Located in Scooba, East Mississippi Community College maintains fives campuses throughout the state, alongside a burgeoning distance learning platform. The Golden Triangle campus maintains the associate degree in administrative assistant online path for individuals who want to hone their skills in office processes and management. Comprising 60 credits, this associate of applied science in administrative office technology prepares graduates for entry-level professional roles after two years of studies. Although it takes less time than a bachelor's degree, this innovative program examines the basics of financial systems, communication, records, accounting, office procedures, computer applications, word processing, and transcription to create well-rounded employees. Classes include mechanics of communication, human resource management, social media management, and introduction to Microsoft Office. Though not required, students can elect to complete a work-based learning component and count it as an additional elective. Virtual degree seekers can sit for the Office Proficiency Assessment and Certification exam while enrolled. Though EMCC does not mandate a minimum GPA, all applicants must submit passing ACT, SAT, or ACCUPLACER scores for consideration. EMCC offers low tuition to residents and non-residents alike. Students living in Mississippi pay $150 per credit, while those living elsewhere pay $250 per credit. EMCC receives regional accreditation from the Southern Association of Colleges and Schools Commission on Colleges (SACSCOC). Barton Community College in Great Bend, Kansas, hosts more than 6,000 students annually. Founded in 1965, this two-year institution continues to innovate programs and respond to industry needs. Within that vein, the college offers an accredited associate degree in administrative assistant online program. Provided through BartOnline, this business administrative technology prepares graduates for administrative, secretarial, and clerical roles in corporations, small businesses, nonprofits, and government agencies. This associate in applied science mandates 64 credits and requires two years of study when enrolled full time. Alongside general education requirements, distance education degree seekers complete innovative and modern studies in computer concepts and applications, human relations in business, micro-computing accounting applications, and word processing. Virtual learners can also take Spanish for the workplace to increase their employability. As an open-admissions institution, learners do not need to meet any specific GPA requirements or submit ACT/SAT scores. That being said, students with good GPAs or standardized test scores can use these to apply for several scholarships open to online students. Regardless of location, all enrollees can take advantage of academic advising, an interactive e-Library, financial support, career mentoring, a bookstore, and technological assistance. To learn more about this exciting institution, check out Barton's official YouTube account. Minnesota State College-Southeast Technical began offering online degrees in 2003. Now, the institution boasts many individual courses and more than 20 online degrees, including the administrative assistant AAS. In this program, students acquire the training and administrative support skills necessary to manage the daily operations for an organization. The 60-credit degree includes 16 credits in general education, such as social sciences, mathematics, and the humanities. Learners then complete 44 credits in technical requirements, covering topics in bookkeeping, desktop publishing, and business communications. The program also includes an internship near the end of studies. The administrative assistant AAS online typically takes students two years to complete, though some may choose an accelerated option to finish faster. Online classes at M State primarily run asynchronously, but some classes require scheduled sessions. While no mandatory campus visits take place throughout the year, students must attend an orientation to meet with instructors and peers. Once enrolled, online students gain access to virtual tutoring and career support. For admission, students complete a placement test, either the Minnesota Comprehensive Assessment or the ACCUPLACER. Submitting SAT or ACT scores may replace the need for placement testing. All online students, regardless of location, pay the same tuition. M State holds accreditation from the Higher Learning Commission (HLC). In 1901, Joliet Junior College opened in Illinois and became the first public community college in the country. In order to meet the demands of students across the nation and improve access to its programs, the institution introduced online programs and courses. In the administrative assistant AAS, students learn to utilize the latest technology to thrive in modern administrative positions. The 64-credit program features 15 semester hours in general education courses to provide students with a well-rounded foundation. Learners take 43 semester hours in core courses, learning fundamental skills in accounting, office procedures, and microsoft office suite products. The program also includes six semester hours of electives, which allows students to focus on industry-specific training. The associate degree in administrative assistant online courses run synchronously to enable students to collaborate with their peers. This program represents one of the hybrid programs at JJC, in which students can complete many of the courses required for the degree online. Generally, students take two years to complete the program. JJC features an open enrollment policy, which grants eligibility for admission to all students with a high school diploma or a GED. Prior to admission, however, students must take a placement test or submit ACT or SAT scores. JJC offers tiered tuition rates based on residency, with in-district students benefiting from the lowest rates. In-state students occupy the next tuition rate tier, and out-of-state students represent the highest rates. JJC holds accreditation from the Higher Learning Commission (HLC). In response to changing home, work, and study dynamics, Southeast Technical Institute developed online programs that increase access and flexibility for its students. One of the 14 programs available online, the administrative assistant AAS provides students with the clerical, technology, and management skills required by office managers and administrators. The 68-credit degree runs four semesters, and students typically finish the program within two years. In the first year, classes cover core business topics in accounting, marketing, and finance. During the second year, students delve into the technology and social components of the field. Additionally, students complete 12 credits in technical electives in the second and final year, which provides them with more in-depth business training. At Southeast Tech, online courses typically run asynchronously, allowing for scheduling flexibility. Some courses, however, may require students to attend class at a set time. Southeast Tech grants online students access to student services, academic support, the digital library, and career services. Furthermore, all online students pay the same tuition rate no matter where they live. For admission into the associate degree in administrative assistant online program, applicants need a high school diploma with a 2.0 GPA. Southeast Tech also requires applicants to submit ACT or SAT scores. The school welcomes transfer students from other accredited colleges and universities. Eligible transfer credits must meet a 2.0 GPA requirement or higher. Southeast Tech holds accreditation from the Higher Learning Commission (HLC). In addition to its four campus locations throughout Pittsburgh, Pennsylvania, Community College of Allegheny County offers many online courses and programs. With 16 degrees available completely online, students from outside the state can access CCAC degrees without ever leaving home. The AS in administrative assistant prepares graduates to organize and manage offices with the technology and software knowledge required for these positions. The associate degree in administrative assistant online comprises 62-65 credits. Students typically take two years to complete the program, studying throughout four semesters. Courses cover topics in communication, business fundamentals, and information and administrative technology. Students also complete 15-18 credits in electives, choosing from courses in math, accounting, and science, along with specialized business options. At CCAC, online courses combine asynchronous and synchronous study elements, providing students with flexibility and opportunities to collaborate and interact with peers. Online students benefit from virtual tutoring, student services, and a digital library and bookstore. Tuition rates depend on the applicant's place of residency, with students living in Allegheny County paying the least and out-of-state students paying the most. CCAC features an open enrollment policy, which grants admission to any student with a high school diploma or a GED. Students do not need to submit standardized test scores, a minimum GPA, or work experience. Transfer students with a GPA of 2.0 or higher, however, should apply for transfer credits. CCAC holds accreditation from the Middle States Commission on Higher Education (MSCHE). Dedicated to improving educational delivery, Metropolitan Community College has offered learners online program options for more than 20 years. One of its many online degrees, the AAS in office technology with a concentration in administrative assistant provides students with the skills to manage an organization's office operations. In this program, students channel their office technology training into the administrative assistant profession. The degree consists of 97.5 credit hours total, including 27 credit hours in general education courses like communications, humanities, and mathematics. Students also complete 54 credit hours in the major, focusing on office technology topics like databases, word processors, and spreadsheets. The administrative assistant concentration comprises 16.5 credit hours that cover leadership, accounting, and business. The average student takes two years to complete the associate degree in administrative assistant online. While this timeline requires students to study full time, asynchronous online delivery at MCC makes scheduling easier for working professionals. Online students gain access to the learning center, career services, and other academic support resources. For program admission, applicants need a 2.0 GPA on previous transcripts. MCC encourages transfer students with a 2.0 GPA to apply for transfer credits. With four start dates throughout the year, candidates can begin their degree during any of the quarter terms. Tuition rates vary depending on residency, with Nebraska residents receiving lower tuition rates. MCC holds accreditation from the Higher Learning Commission (HLC). Beginning in 1995, Cincinnati State Technical and Community College's online education system now offers more than 200 courses and 20 programs. The online AAB in administrative office professional with a track in administrative assistant teaches students the practices, competencies, and technologies commonly used by administrative assistants. In this track, students focus on business-related tasks, whereas the other two available options focus on medical and legal administration. Throughout the two-year associate degree in administrative assistant online, students complete 65 credits across six semesters. Cincinnati State breaks the courses down into categories of general education, technical courses, and basic skills. In the technical courses, students learn to use different software and technologies. The basic skills courses cover core business topics like business law, accounting, and communication. Students also choose electives in management, communication, and accounting, along with a capstone project. At Cincinnati State, online courses run asynchronously for the most part, with the odd class requiring scheduled sessions. The academic year consists of three 15-week semesters, and classes run in sessions lasting 5-15 weeks. Tuition rates depend on where students live, with in-state students receiving lower rates than others. For admission into the program, applicants do not need to meet specific academic standards. A high school diploma or a GED and ACT or SAT scores suffice. Transfer students with a 2.0 GPA should apply for transfer credits to decrease degree time and cost. Cincinnati State holds accreditation from the Higher Learning Commission (HLC). Since Monroe Community College opened its doors in New York in 1961, the institution has focused on innovating its programs and course delivery. That drive led to the creation of an online learning system, in which MCC now offers more than 100 courses, 12 fully online programs, and several hybrid programs. The AAS in office technology with a focus in office administrative assistant, one MCC's many hybrid programs available, gives students the business and administration skills and knowledge necessary to work in a variety of organizations. Requiring 64 credits, this hybrid program takes students two years to complete. The associate degree in administrative assistant online consists of core topics in accounting, management, and communications, along with electives in various disciplines. During the final semester, students take more advanced office-related courses, such as office simulations, transcription, and office procedures. Online courses at MCC primarily run asynchronously, allowing students to study during the hours that suit them best. While online students can access the majority of courses in the AAS in office technology online, some courses require campus visits. In-state students looking to take advantage of MCC's online classes also benefit from lower tuition rates at MCC, as out-of-state students pay higher rates. For admission, applicants need a high school diploma or a GED. Applicants must also take a placement test or submit ACT or SAT scores. While MCC encourages transfer students to apply, every student must complete at least 24 residency credit hours at MCC to graduate. MCC holds accreditation from the Middle States Commission on Higher Education (MSCHE). Established in 1966 in South Carolina, Piedmont Technical College offers education and training in career-focused fields. The institution boasts a variety of online courses, including several fully online degrees. In the online AAS in administrative office technology, learners gain the technology and technical skills needed to manage operations in offices throughout various industries. Concentration options in accounting, medical, legal, and medical coding and billing allow students to specialize in a specific industry. The associate degree in administrative assistant online consists of 63 credit hours, 18 of which students spend in general education courses, such as communication and mathematics. Learners also take 15 credit hours in core courses that cover topics in computers and software. Students then take the remaining 30 credit hours in advanced administration topics like accounting and database management. Students typically complete the program in two years. While PTC online courses run asynchronously and provide scheduling flexibility, students may need to complete some courses in the administrative office technology program on campus. PTC offers residents of Greenwood, Newberry, McCormick, and Saluda counties preferred tuition rates. In-state students who do not reside in those counties still pay less tuition than out-of-state or international students. PTC features an open admission policy for applicants, which provides admission eligibility to students with a high school diploma or GED. Applicants must complete a placement test or submit SAT or ACT scores as part of the application. PTC holds accreditation from the Southern Association of Colleges and Schools Commission on Colleges (SACSCOC). Bluegrass Community and Technical College strives to innovate and transform its educational system to meet the needs of its students. Online courses and fully online degrees allow students to study at a distance or while working. The online AAS in administrative office technology provides graduates with the skills needed to work in contemporary office environments and manage the diverse personalities and professionals within it. The program features specialization options in financial assistant, legal, administrative, and desktop publishing. Spread across two years and four semesters, the associate degree in administrative assistant online comprises 60-61 credits. During the first semester, students engage with general education courses. The second semester introduces students to office technology courses, and the third semester delves into more advanced topics. In the final semester, students take specialization and office simulation courses to obtain practical experience. Learners with prior college training can decrease both program time and cost by applying for transfer credit. The online programs at BCTC run asynchronously to accommodate all students and schedules. Tuition rates vary depending on the student's location, with in-state students paying the lowest rates. Students who reside in counties that border Kentucky also receive lower tuition rates than out-of-state learners. The open admission policy at BCTC enables students with a high school diploma and GED to meet the admission requirements. Students must also submit SAT or ACT scores. BCTC holds accreditation from the Southern Association of Colleges and Schools Commission on Colleges (SACSCOC). In an effort to innovate and improve access to its programs, Dakota College at Bottineau introduced online learning. With more than 100 online courses and several online programs, students from all over the country can experience student life at DCB. The online AAS in administrative assistant equips students to perform the tasks and utilize the technology required by administrative professionals in various office settings. The associate degree in administrative assistant online requires students to complete 61-64 credits in total. Typically, learners complete the program in two years, fulfilling four semesters of coursework. During the first year, the program focuses on foundational courses, particularly in areas like office technology, business, and communications. By the second year, students delve into more advanced topics like office management, information security, and accounting. The online courses at DCB primarily run asynchronously, though some classes may feature scheduled sessions or class meetings. While the institution welcomes students from across the country, in-state students pay lower tuition rates than others. Similarly, students who reside in one of the states bordering North Dakota pay lower rates than out-of-state students. At DCB, potential students benefit from an open enrollment system, which requires applicants to possess either a high school diploma or a GED. Students also complete a placement test to determine their readiness and submit ACT or SAT scores for research purposes. Transfer students with less than 25 college credits participate in the same process, whereas students with more than 25 credits do not require ACT or SAT scores. DCB holds accreditation from the Higher Learning Commission (HLC). Administrative assistant associate degree programs prepare candidates for careers related to business administration. Quality programs teach core administrative competencies that are standard to all industries. However, different colleges offer varying opportunities for industry-specific and/or specialized training. Candidates should take these electives into consideration and choose a program based on their individual learning goals. All students in administrative assistant associate degree programs learn similar core skills. These include keyboarding, business communication, computer literacy, and the use of spreadsheets and databases. However, programs vary and prospective students in this field should carefully consider the electives available at different institutions. The sample curricula described below represent some common classes that are typically completed while pursuing this degree. Business Fundamentals: Candidates in this course learn common practices in business office settings, including key business terms and basic business law. Students gain experience working in teams and with business technologies. This class focuses on product development and marketing and teaches relevant theoretical knowledge through hands-on work. Database Concepts and Applications: The ability to sort and retrieve information is critical to business administration; therefore, students in this field need to learn how to design and maintain databases. This course presents an overview of the databases commonly found in business settings as well as the software used to create them. Students also practice the skills required to maintain records, make queries, and generate reports. Desktop Publishing: Students in this course learn the publishing and graphic design applications used in business settings. They gain experience manipulating text and images and utilizing page layout techniques to produce professional-quality publications. Additionally, this class describes typical office documents and examines their preferred layout and design characteristics. Students also learn to design and deliver business presentations. Medical Terminology: This class, which is normally an elective rather than a core course in administrative assistant associate degree programs, introduces commonly used terms in medical office settings. It teaches students definitions and emphasizes correct spelling and proper pronunciation. Students also learn common abbreviations used on medical records and billing sheets. Word Processing II: This class teaches intermediate and advanced word processing. Students improve their keyboarding skills and learn more about the software capabilities of word processors. By the end of this course, students can execute advanced functions in Microsoft Word, such as merging text and documents, customizing autocorrect and document styles, and enabling document protections. HOW LONG DOES IT TAKE TO GET AN ONLINE ADMINISTRATIVE ASSISTANT ASSOCIATE DEGREE? Most administrative assistant associate degree online programs take two years to finish and require students to complete about 60 credit hours. However, some programs offer options such as industry specializations or internship experiences that may require extra time. The additional skills learned through these optional credits may be worth delaying graduation for some candidates, and internships often lead to important professional connections. Many higher education institutions accept incoming transfer credits, which can be used to fulfil certain general education requirements and enable incoming transfer students to graduate more quickly. Additionally, transfer credit is given for military training at some institutions; veterans should consider this fact when selecting colleges. Some courses are available in accelerated formats, and candidates who prioritize early degree completion should discuss this option with their college advisor. Furthermore, administrative assistant associate degree online programs that deliver material asynchronously often offer accelerated classes. Administrative assistant associate degree online programs can lead to careers in several interesting fields. For example, students who demonstrate outstanding communication skills may opt to work in reception roles, while those who can accurately record, query, and generate reports in financial database systems can work as billing clerks. Additionally, candidates who excel at maintaining and querying medical records and can master complicated medical terms may choose to become medical records technicians. This role involves producing and maintaining financial records for businesses. Professionals in this field must be able to maintain highly accurate records of financial transactions and communicate cash flow trends through reports to other organizational employees. Court reporters play critical roles in the U.S. legal system by quickly and accurately typing up transcripts of court proceedings to help lawyers and judges carefully review cases. Some states require court reporters to be licensed; further study may be required to meet this qualification. Providing patients with quality care depends on up to date and easy to access medical information. Medical records and health information technicians streamline patient care by accurately recording health data and organizing information according to clinic standards. Receptionists greet visitors, answer phones, and respond to email inquiries. They may also be responsible for other administrative duties, such as scheduling appointments, facilitating meetings, and maintaining business calendars. This may be the most generalized career in the administrative field. Professionals in this role maintain and retrieve paper files and information in databases, prepare documents and business letters, and provide other forms of clerical support for staff members.